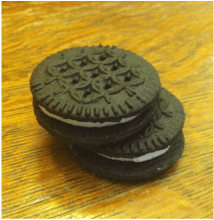 Okay, so in recent news, the LiveGfree Sandwich Cookies were a solid 3.5 out of 5. The cookie part was yummy, I dare say it tasted more chocolatey than regular Oreos. So, why only a 3.5, you ask? Well, it’s the creme’s fault. Flavor-wise, it was fine. Not identical to regular Oreos, but fine. The texture was sandy, which didn’t totally ruin the overall experience, but definitely made it less enjoyable. Oreos are supposed to be fun to eat–not like eating something that fell out of your beach bag and into the sand. Overall, I would eat them again. But I’d probably leave off the creme, which is usually my favorite part. They’re not fantastic, but they’re not horrible. They’re just, eh. I was terribly disappointed as I’d had high hopes for these cookies, and these kind of dashed those. 😦 Though maybe I’ll use them in a chocolate cream pie as the crust . . . hmm . . . that’s a great idea! Off to get some of the ingredients as soon as I finish this little post! they taste FAR better, and it assists in canceling out the sandy texture. Well, ya win some and ya lose some. What have y’all’s most disappointing Gluten Free product tests been? Let me know in the comments, and have a fabulous day!